I spent yesterday with my mum in London; we wandered around Chelsea for a good part of the day before heading to explore Harrods and then for a bite to eat at Tibits for dinner (which was super delish!). Much to my delight, a food market was on in Chelsea and with a fair few vegan options - we tried an iced tea with agave, lime and cloves, a slice of the most incredible chocolate mojito cake and plenty of olives, we also picked up these gorgeous purple potatoes and something slightly unusual that caught my eye...elephant garlic. 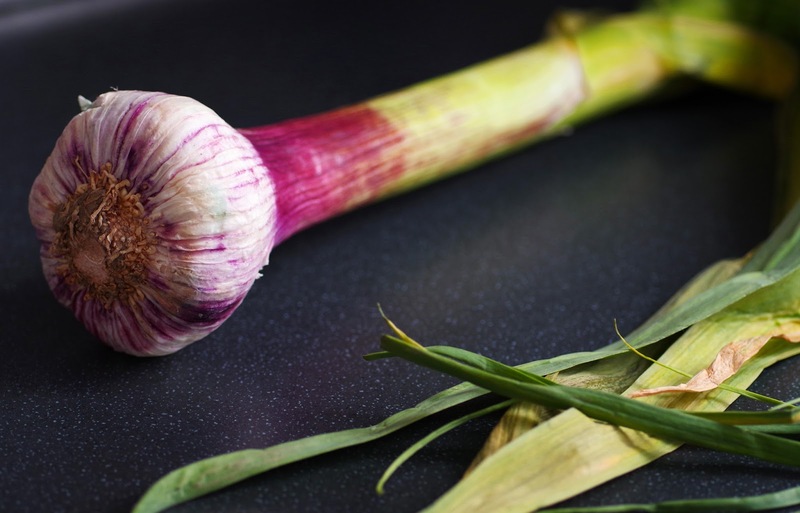 Had I known that the elephant garlic would be rather pungent and even after putting it inside another bag that we'd still be able to smell the garlicky aroma whilst wandering through Harrods, perhaps I would've thought twice about purchasing it. But it made for an amusing time and I will definitely remember the day I was armed to ward off a whole family of vampires whilst wandering around London, for years to come. 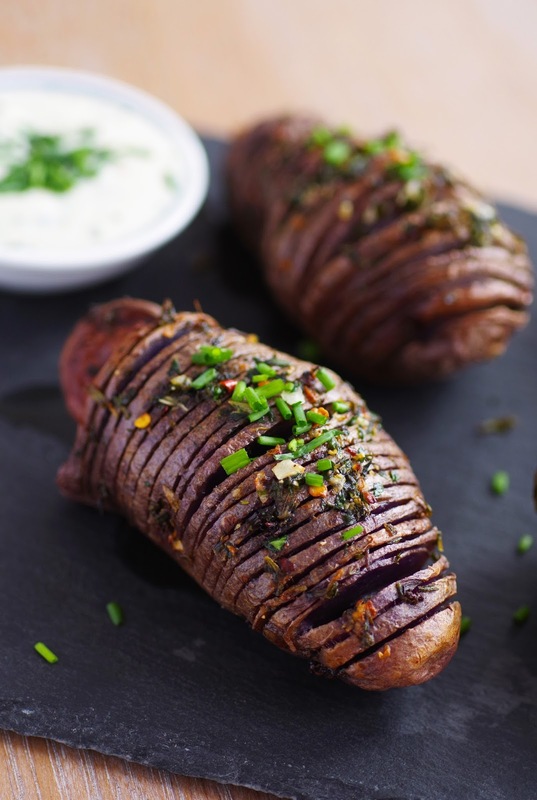 This next recipe is simple, yet completely delicious, the perfect side to a BBQ (which is compulsory in England the second the sun shines) or even a roast dinner and whilst you don't have to use purple potatoes, they do contain 4x the antioxidants of regular potatoes and they look great too! I thinly sliced the potatoes almost all the way through (placing the potato between wooden spoons and then carefully slicing until the knife hits the spoon) and then brushed with a mix of olive oil, rosemary, thyme, chives and parsley, a pinch of chilli flakes and of course, that gorgeous elephant garlic (regular garlic will work too). 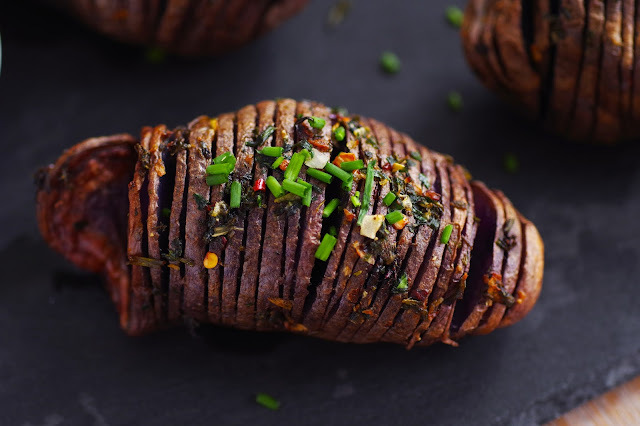 Despite what you might think, these potatoes are actually super easy to make and they create the most wonderful end result, with crisp, flavourful edges and a hot steaming middle, these are no ordinary potatoes! Wash the potatoes and one at a time, place between two wooden spoons or a pair of chopsticks, slice thinly along the potato, place in the baking dish and repeat with the rest. Crush the garlic and mix with the herbs, oil, chili flakes, salt and pepper. Brush the potatoes with 2/3 of the mixture and place in the oven for 40 minutes. 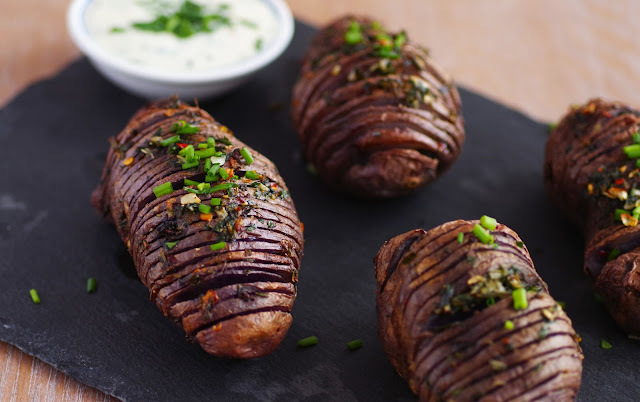 After 40 minutes, brush the potatoes with the remaining garlic and herb oil and bake for a further 15-20 minutes.